Meanwhile, Chevron is claiming in arbitration that the Republic of Ecuador should pay the judgment, and the two parties are duking it out before a panel of corporate trade lawyers who rent office space at The Hague and act as "judges" -- more about them later. It's heavily redacted. If it's true -- as Chevron says it is -- that the oil giant is innocent, and the truth is what it seeks, then why won't Chevron release the un-redacted, unedited playbook for all to see? At pits Texaco said it cleaned, Chevron -- according to its own playbook -- found contamination during its secret PIs or pre-inspections. To avoid or reduce the contamination Chevron, during the official judicial inspection, took soil only from the top layer. The rejoinder reads: "During the JIs (judicial inspections) Chevron's experts sought to avoid finding pollution by sampling only to depths that it knew to be clean. 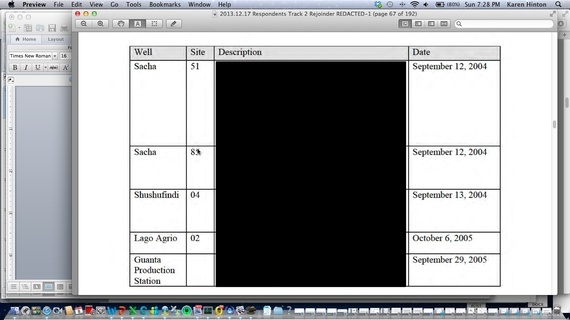 For example, at Shushufindi 24, the soil boring log at pit 2 shows that during its PI, (pre-inspection) REDACTED "Then at the JI, Chevron strategically chose to take surface soil samples only -- avoiding the known contamination below."